Did you know you can make Hummus Without Tahini? No worries if you don’t have tahini on hand, you don’t need it at all. 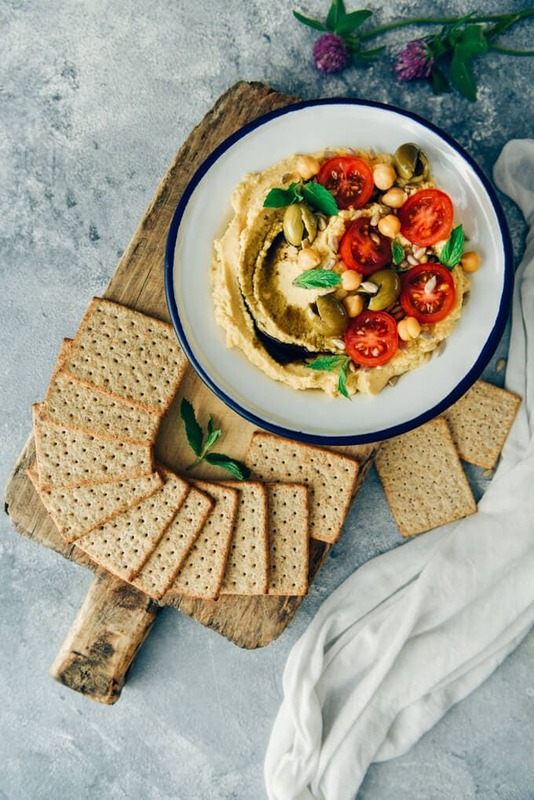 It takes 5 minutes to prepare a simple yet amazing hummus which is way tastier and cheaper than the store bought stuff. Plus, it is low in calories when you don’t add tahini. Homemade Hummus with or without tahini is super easy to make. 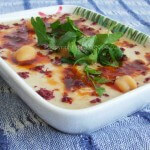 You need a can of cooked chickpeas, garlic, lemon juice, olive oil, hot water, salt and cumin. 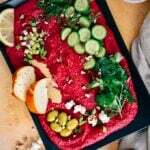 Although tahini is considered as one of the staple ingredients for a traditional hummus recipe in Middle Eastern cuisine, I think it’s optional. 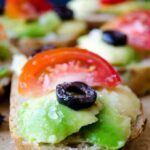 Tahini is not something we always have on hand and this recipe is a life saver when I don’t feel like going out to buy some. I just put everything in a food processor and blend until smooth. Don’t get me wrong. I don’t hate tahini. On the contrary, I’m a fan of it and love to use it in recipes like our Vegan Potato Salad with Tahini Dressing. However, we don’t have it on hand unless I plan to make something with it ahead of time. This hummus recipe without tahini is for the days when I spontaneously decide to make a dip as an appetizer. Unlike tahini, we always have ready to use chickpeas in the freezer, so this is one of my go-to recipes for unplanned dinner parties too. The measurements here are for my taste, so you might need to play with them to have the result you desire. For example, you can use more or less garlic and lemon juice, add more spices. Testing is the only way to reach the best result for you. 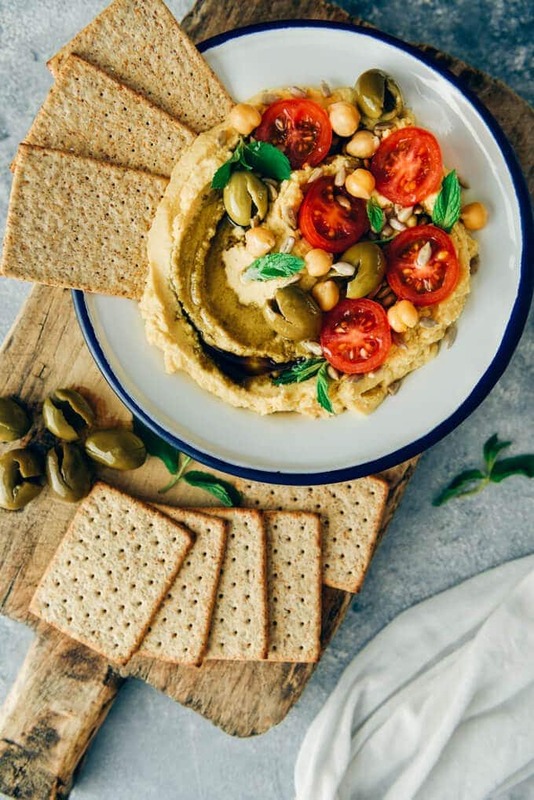 When I have to make hummus without tahini, I sometimes substitute Greek yogurt or peanut butter for tahini and the result is as tasty and creamy. Besides being easy, making hummus at home is fun too. You can always create your own hummus recipes by adding your favorite ingredient into the food processor. Have you ever tried Roasted Red Pepper Hummus? It is great when you want your dip more flavorful. I would love to hear what other flavors you like to add in your hummus. Please share them in the comments section below. Homemade creamy hummus made without tahini. Ready in 5 minutes. Put all ingredients for hummus in a food processor. Process until smooth. Add in extra water if it’s too thick. Taste and add extra lemon juice or salt if needed. Transfer into a bowl, make a swirl and drizzle pumpkin seed oil over it. Garnish with tomatoes, green olives, chickpeas, sunflower seeds and mint springs. Serve with crackers, vegetables, chips or pita. Actually I make white bean dip often, because I like what I can add to it, instead of some people who only make hummus. But I do use great northern beans instead of chick peas because they have a softer, smoother texture. I’ve had hummus in restaurants that’s mealy and dry, and I don’t find that appealing! Sorry, hummus without tahini if exactly what you don’t want to eat and exactly what you would get it you buy your hummus in the markets around, like qfc, pcc, and so on. This hommus would of course also lack all the benefits that only tahini can provide to a food. Who knew how easy it was to make hummus without tahini. It was surprisingly creamy. Admittedly, I did add a little bit more olive oil into the mix. It was so SO good. 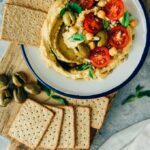 I am so happy to have found the recipe for such a great hummus recipe without the need of tahini. I’m glad you love this recipe. It’s really surprising that we don’t need tahini at all.